N'Golo Kanté is the mirror-world Lionel Messi. 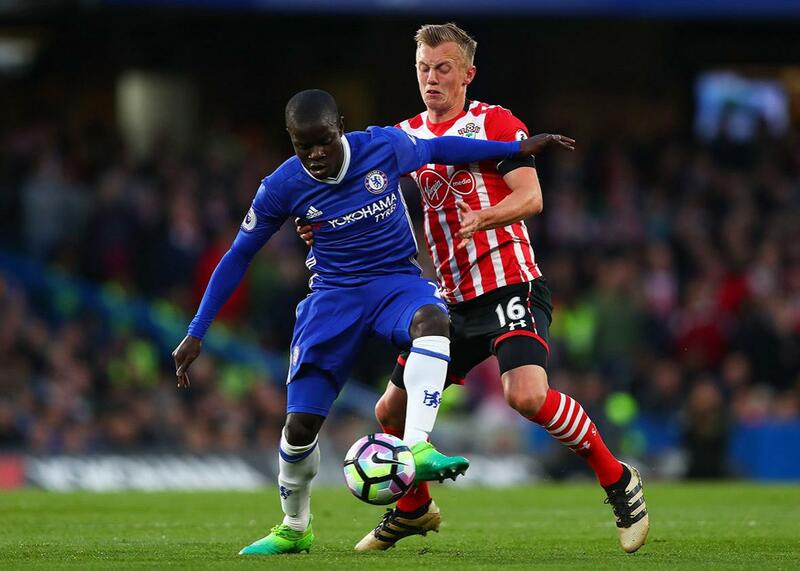 N’Golo Kanté of Chelsea holds off James Ward-Prowse of Southampton during a Premier League match on April 25 in London. The best player in the Premier League has scored just two league goals in two seasons. The most dynamic, most exciting individual on the field in pretty much every match he plays in has notched five assists in that time, or about one for every 14 games he plays. Despite this, Chelsea defensive midfielder N’Golo Kanté just took home the Professional Footballers’ Association’s Player of the Year Award, making him just the second nonattacker to win the player-voted honor since 2000. The pint-sized Frenchman set on permanent seek-and-destroy mode is soccer’s premier disruptive force, and in the last two years has made a bigger impact on the English game than any goal-scorer. The two Premier League teams Kanté has suited up for have lost just eight games out of 70 with him on the field. His Chelsea team has slipped of late but still has a four-point cushion on Tottenham with four games to go in the season. Last year, he led Leicester City to perhaps the least probable title in sporting history. The rest of that team’s starting lineup is still there, including forward Jamie Vardy and last year’s PFA PotY winner Riyad Mahrez. That Kanté-less bunch has ridden a recent five-game winning streak all the way to 11th place. What makes N’Golo Kanté such a dominant force? He is the mirror-world Lionel Messi, the immovable object to the other’s irresistible force, with the same otherworldly balance, timing, and Road Runner–esque ability to accelerate to top speed (or come to a dead stop) in a single step. The difference is that Kanté uses his skills in the service of destruction. He doesn’t just disrupt. He demoralizes. Kanté punishes his opponent’s little mistakes better than anyone else in the world, even the ones you can normally get away with in the professional game. A second’s worth of indecision as passing options are cycled through, a sloppy reception that requires an additional touch to corral, an underhit pass that’s going to get there eventually—all of these invite him to disprove the adage that no player can move faster than the ball. He moves so quickly and reads the game so well that, like the craftiest cinematic villains, he’s always one step ahead of whoever’s supposed to be the hero. He’s so quick that when the man in possession turns away to shield the ball, Kanté can literally run circles around him, ducking under the outstretched arm that’s meant to hold him off then using a Charles Barkley–esque understanding of angles and leverage to force larger opponents––he’s listed at 5-foot-7 the way Danny Almonte was listed as age 12––off the ball and claim it for his own. Every great defensive midfielder knows how to frustrate the other side’s attack. What sets Kanté apart from those who share his position is his omnipresence. He tackles, intercepts, fouls, and pesters seemingly every opponent at once. He doesn’t just win the ball in that dangerous and often crowded zone in front of the central defenders but ranges up and across the pitch so he can stifle attacks at their weakest points, punishing those little mistakes wherever he can find them. His nickname should be Visa, because he’s everywhere opposing players want to be. His teammate Eden Hazard has likened having Kanté in the lineup to playing with twins. While it’s easy to be in the right spot when you can be everywhere simultaneously, Kanté’s freedom to roam owes a lot to his teams’ systems. With Leicester, he played next to another conservative midfielder in Danny Drinkwater. At Chelsea, a formation change early in the season by manager Antonio “No Relation” Conte freed Kanté from a more conservative role that required him to cover the typical area of operations for his position, putting another deep-lying midfielder alongside him and an additional central defender behind, giving him more license to hunt the ball. For France last summer in the European Championships, Kanté was limited to that narrow role he was eventually freed from at Chelsea. That division left Les Bleus, in effect, with one Kanté instead of the Kanté twins. They still won every match in which he appeared and managed a win, a draw, and a loss––the final to Portugal––in the ones he didn’t. Portuguese forward Eder’s title-deciding goal was a situation made for Kanté to snuff out. After Eder holds off center back Laurent Koscielny, Paul Pogba pulls up his run from behind while Blaise Matuidi hangs back to play a passing lane Eder never sees. Kanté, we’re left to imagine, would have teleported in from across the field and wrested the ball away as soon as his Portuguese opponent took his first awkward touch away from Koscielny. Kanté likely wasn’t on the field for the final because French coach Didier Deschamps was looking to juice his offense against a Portuguese team built to absorb pressure. And while Kanté’s efforts on the offensive end aren’t as irredeemable as those stats at the top might indicate––players as fast and smart as Kanté will always have some utility going forward, and his ability to win the ball high up the field makes attacking that much easier for his teammates––there’s something imprecise about his contributions. Consider, for instance, the dazzling run to draw four defenders at the beginning of this video, after which he badly overhits his chip to an open Hazard. You often see teammates stretching or sliding an extra step to reach Kanté’s passes, slowing the attack down and leaving them open to the same kinds of mistakes he relishes when his opponents make them. He’s much better at aiming for a general area than the man himself. Still, if he’s limited and one-dimensional then he’s limited and one-dimensional in the same way Mad Max: Fury Road was. Sometimes you don’t need another dimension, not when your presence has already rearranged the league’s power structure twice. After this season, every team in the world will want their own version of Kanté, which could lead to major changes in player development the world over. Players that agile and that smart have been getting turned into off-brand Messis for a decade now, giving the world a surplus of in-cutting wingers. If clubs and their academies begin to nudge some of them down the opposite path, we’ll get to see whether Kanté’s dominance is the result of his singular gifts or a smart allocation of resources. As for Kanté himself, his days dominating the Premier League may already be numbered. Rumor has it he’s Real Madrid’s top transfer target for the summer, which means next year Messi could find himself facing off against the only person in the world who could hope to keep up with him: the man in the mirror.